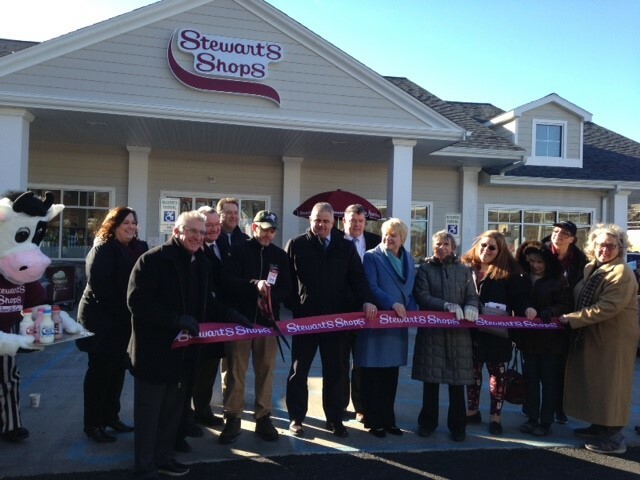 Stewart’s kicked off their 1st grand opening of 2019 with the opening of their newest shop in Burnt Hills. This shop at the corner of Route 50 and Lake Hill Road is a true gateway to the village of Burnt Hills. To celebrate, Stewart’s donated $1,000 to the Burnt Hills-Ballston Lake Education Foundation. The brand-new shop features all of your favorite Stewart’s products along with a greater selection of easy food items such as freshly made pizza (pie and by the slice). They have also added a walk-in cooler called a beer cave and a beverage bar with Pepsi, iced tea and espresso. There’s also plenty of seating, plus expanded parking and fuel service with diesel. Pictured center is the Stewart’s team along with Flavor the Cow was Senator James Tedisco; Assemblywoman Mary Beth Walsh; Tim Szczepaniak, Town of Ballston Town Supervisor and Pete Bardunias, President/CEO of The Chamber of Southern Saratoga County and members of the Burnt Hills-Ballston Lake Education Foundation.